Samsung and Globalfoundries Beat TSMC to FinFET - What This Means For AMD, Nvidia and Intel. Samsung and Globalfoundries Beat TSMC to FinFETs – What This Means For AMD, Nvidia and Intel. 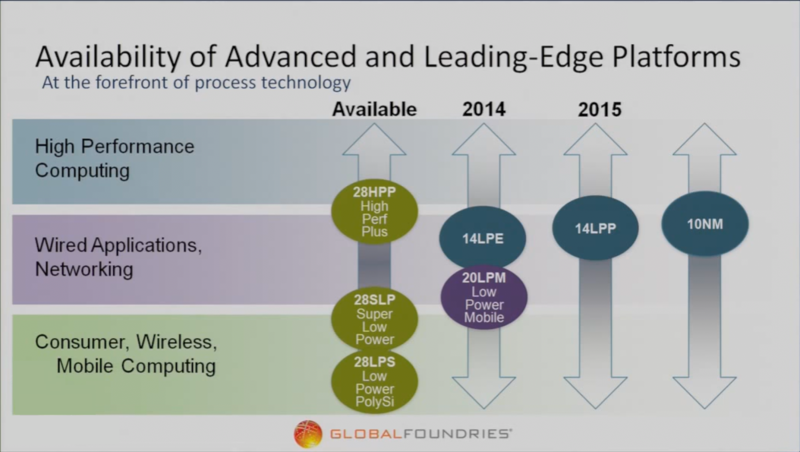 Both Globalfoundries and Samsung have beaten TSMC in the race to FinFETs with their 14nm LPE and LPP nodes. Announcing that mass production has already begun. This news comes courtesy of a Digitimes interview with GLobalfoundries’ Senior Vice President Chuck Fox. The cooperative effort between both companies means that 4 worldwide fabs will have full 14nm LPE and LPP manufacturing capability in 2015. With a number of those fabs already shipping 14nm products in volume. This is especially important because TSMC has only recently managed to achieve risk qualification on its 16nm FinFET+ process. With volume production scheduled for 2H 2015, putting it behind Samsung by nearly eight months. FinFETs Arriving in 2015 – What This Means for AMD, Nvidia and Intel. 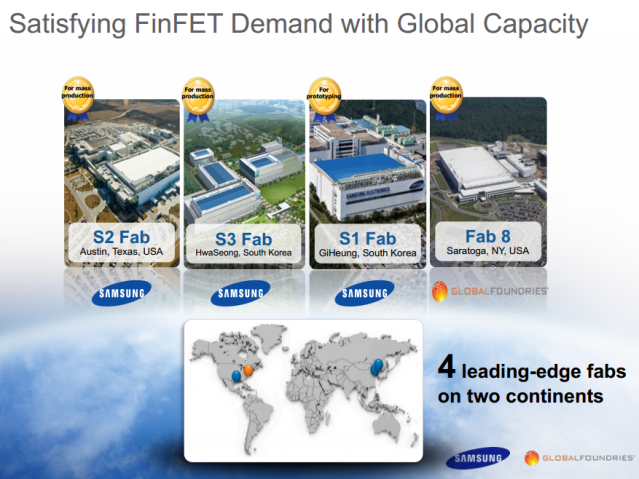 Of the four 14nm FinFET capable fabs between Samsung and GF, Globalfoundries currently has one in New York. Currently the planned schedule for 14nm LPE and LPP production is in 2015. The company will begin volume production of 14nm FinFET slightly after Samsung. 14nm LPE will go into volume production in the first half of 2015 and 14nm LPP in the second half of the same year. Q: Can you tell us when the 14nm process at your company will begin volume production? And why did your company choose to cooperate with Samsung Electronics? A: We plan to begin volume production with a 14nm LPE (low power early) process in the first half of 2015 and then push ahead with a 14nm LPP (low power plus) process in the second half of the year. Based on chip design projects commissioned by our clients, we believe a number of clients will produce wafer starts using 14nm LPE process initially. However, we expect the number of clients as well as wafer orders to grow robustly when we enter the 14nm LPP process, which will help ramp up our market share and sales significantly. Luckily both flavors of 14nm FinFET share the same infrastructure so designs can migrate from 14LPE to the more advanced LPP version organically and very efficiently. Which is why GF expects to see both the number of customers and the wafer orders of existing customers increase with 14LPP. 14LPP is better than 14LPE in a few distinct categories. It costs the same, it’s faster and consumes slightly less power. The only drawback is that it arrives sometime after 14LPE. So for early adopters 14LPE is still worthwhile especially since both processes share the same infrastructure as mentioned above. So what does this all mean for Red, Green and Blue. I’m referring to AMD, Nvidia and Intel naturally. Intel has already began shipping small, low power 14nm products this year with high performance parts coming in the middle of next year. So the company isn’t significantly ahead of the industry as it was once in terms of process nodes. Which is very exciting for the rest of the industry players. Because it puts everyone on a relatively equal playing field. Nvidia announced that it will be making GPUs on TSMC’s 16nm FinFET+ process, which is scheduled to go into volume production in early Q3 of 2015 at around July or August. So expect to see 16nm FinFET+ products to show up about three months afterwards from Nvidia at around October or November. We don’t know exactly which products we will see from Nvidia on the new process first. Reports suggest that the company will debut a GM204 (GTX 980, 970) shrink in 16FF+ first with other products following later. Including Nvidia’s new Pascal architecture in 2016. This leads us to AMD. The company recently revealed that it only intends to bring 20nm and 28nm products to the market in 2015 with FinFETs coming in 2016. The company also revealed that it will continue to manufacture CPUs/APUs in addition to GPUs and semi-custom SOCs at Globalfoundries. So we’re bound to see 14nm FinFET APUs, GPUs and SOCs from AMD at some point. We’ve also seen reports of AMD actually tapping Samsung directly as a foundry to manufacture FinFET chips for it this year. Perhaps it has done so in a move to capitalize on Samsung’s impeccable timing with 14nm. Interestingly enough, KitGuru believes that AMD may very well release 14nm FinFET products next year but suggests that the company chose not to reveal this information for competitive reasons. One of the most interesting things to find out is whether AMD plans to use GlobalFoundries’ services to make chips using 14LPE or 14LPP fabrication processes in 2015. Officially, the chip designer implies that next year it will sell chips made using 20nm and 28nm manufacturing technologies, but, perhaps, the company does not disclose all of its plans and there are surprises incoming. AMD is easily Globalfoundries’ biggest customer. So if GloFo has chosen to introduce 14LPE a few months ahead of 14LPP to improve the time-to-market, we’re inclined to believe that AMD had something to do with that decision.